Federal OSHA has released details on 20 significant fines (over $100,000) totaling $4,992,945 from January to March 2019. The highest single penalty in the 1st quarter was $1.3 million, and the top 5 fines accounted for more than $2.5 million. Common citations included machine and dust hazards, trenches and machine guards. Here are details on the highest OSHA fines proposed in the first quarter. Many are still pending final decisions. OSHA proposed penalties of $1,326,367 to Dowa THT America Inc. after the company exposed employees to atmospheric, thermal, electrical and mechanical hazards as they performed maintenance inside heat-treating furnaces. OSHA also placed the company in the Severe Violator Enforcement Program. OSHA cited 25 willful, serious and other-than-serious violations for hazards related to confined spaces, falls, machine guarding, respiratory protection, chemical exposures and electrical equipment. The company also failed to provide adequate personal protective equipment and train their employees on hazards in the facility. See details. RKM Utility Services Inc. was cited after an employee died after exposure to dangerous levels of hydrogen sulfide while working in a trench in Dallas. OSHA inspectors determined the company exposed employees to a hazardous atmosphere, failed to train employees on the health hazards of hydrogen sulfide and did not drain water from the trench. Employers are required to test the air to detect the presence of the gas, use exhaust systems to reduce hydrogen sulfide levels, train workers on hazards and control methods and provide personal protective equipment if control methods used are not sufficient to reduce hydrogen sulfide levels. Review the safety and health citations. OSHA cited von Drehle Corp. for exposing employees to electrical hazards; lack of machine guarding; allowing combustible dust to accumulate on surfaces; failing to lockout machinery to control hazardous energy; exposing employees to arc-flash and allowing slip, trip, and fall hazards. See details. Crown Roofing LLC was cited for exposing employees to fall hazards at two separate residential worksites. OSHA initiated inspections as part of a Regional Emphasis Program for Falls in Construction, after inspectors observed employees working on roofs without fall protection. The company has been inspected 17 times in the past five years, with 11 of the inspections resulting in repeat violations of the fall protection standard. Review the citations. Tap Rack Bang Indoor Shooting Range LLC was investigated after OSHA received a complaint of worker exposure to lead during firing range activities. Inspectors found airborne lead exceeding the permissible exposure limit and lead contamination on surfaces throughout the facility. OSHA cited the company for failing to replace damaged personal protective equipment, and medically monitor employees for lead-related illnesses; and for sweeping up lead debris rather than using vacuum methods with high-efficiency particulate air filters. See details. OSHA inspectors determined that UPS failed to maintain exit routes at multiple facility locations. A roller extension unloader device was permanently located and attached to a belt conveyor limiting the access route, management allowed packages to accumulate in aisles, and some access routes were reduced to just seven inches. The company is contesting the findings. Read more. Etna Construction Inc. was cited after OSHA determined the company failed to install protective systems inside an excavation area; provide a safe means of exit from the excavation area; correct excavation deficiencies; and instruct employees on recognizing excavation hazards. The employer also failed to ensure employees wore hardhats to prevent head injuries and did not properly guard protruding reinforced steel. Review the citations. Conn-Selmer Inc. was cited for two repeated and seven serious safety and health violations after OSHA inspectors determined the company exposed workers to copper dust in excess of the recommended permissible exposure levels; failed to provide machine guarding, adequate controls to minimize exposure, and safety procedures to prevent employees from coming into contact with operating parts; and neglected to follow requirements for respiratory protection, electrical safety, and labeling hazardous chemicals. See details. Following an amputation, Bruce Foods Corporation was cited for 24 serious safety violations including failing to train employees in lockout/tagout procedures, inadequate machine guarding, lack of fall protection, and exposing employees to live electrical parts. See details. Ammunition manufacturer AMTEC Less Lethal Systems Inc. was cited for multiple serious violations and a willful violation that carries the maximum penalty allowed after an explosion fatally injured two workers. OSHA says the company failed to develop and implement management of change procedures when they increased the maximum explosive limits of pyrotechnic flash powder in or near the blast booths from 200 grams to 500 grams. OSHA also cited the company for failing to maintain the engineer’s specifications for the blowout panels installed on the blast booths; using blast booths that did not comply with good engineering practices; and failing to train employees on the operating procedures for work in the diversion section production room. Review the citations. Avid Pallet Services LLC was cited after a follow-up inspection found employees continued to be exposed to wood dust. Inspectors determined the company failed to implement sufficient engineering controls to limit dust exposure, as well as train employees on the health hazards of wood dust. OSHA had previously cited the company for these hazards in 2016. Additional citations were issued for failing to evaluate respiratory hazards, medically evaluate and fit test employees using respirators, inform employees of their right to see exposure records and use adequate machine guarding on band saws. Read more. Noah’s Ark Processors LLC was cited for process safety management violations after an employee suffered severe burns from exposure to anhydrous ammonia. Other citations include failing to guard roof openings and electrical safety and lockout/tagout violations. Review the citations. Hilti Inc. was cited when inspectors determined that the company failed to provide forklift operator training and instructions to employees operating the vehicles and ensure that employees performed daily forklift inspections. The company also exposed employees to corrosive materials; failed to provide eyewash stations and showers in the work area; failed to develop a written hazard communication program and data sheets for forklift battery electrolytes and failed to notify OSHA within 24 hours of any incident that leads to an employee’s hospitalization, as required. Read more. $157,792 to project construction and engineering companies following two fatalities at a Florida construction site. 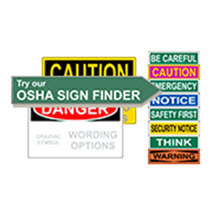 The ComplianceSigns.com OSHA Sign-Finder makes it easy to find just the sign you need. Select by sign header, wording, symbol, language, primary use and more. Our OSHA safety signs address dozens of topics, including chemical, electrical and industrial hazards. All our OSHA safety signs comply with the OSHA 29 CFR 1910.145 standard for sign color and design.